The Congress party on 6 January asked Prime Minister Narendra Modi and Union Finance Minister Arun Jaitley to stop boasting that India is the fastest growing economy. "The GDP is at a 4-year-old low now. Will Prime Minister Modi and Finance Minister Arun Jaitley stop boasting that India is the fastest growing economy?" 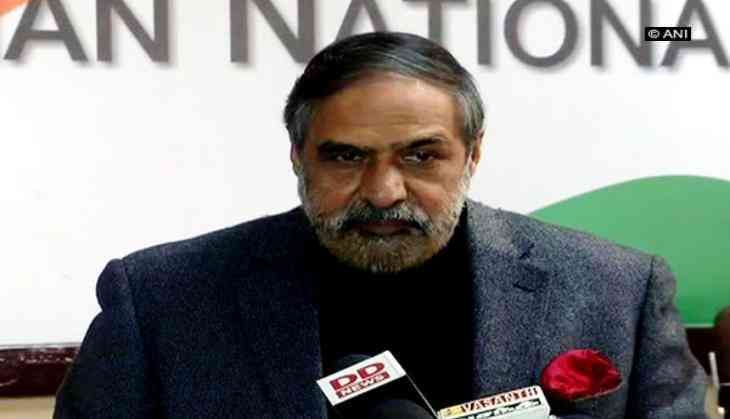 asked Congress leader Anand Sharma while addressing the media. The Congress leader further said the national investment rate has also fallen. "The state of the economy is a matter of great concern. All the parameters are going down. The national investment rate has also fallen. Manufacturing has come down. The situation is grim and the government has no roadmap for recovery", he added. In the wake of the Ministry of Statistics and Programme Implementation releasing Gross Domestic Product (GDP) numbers during 2017-18, Congress President Rahul Gandhi earlier in the day took to Twitter to make a witty remark about Prime Minister Modi and Union Minister Jaitley. Attributing the growth of the economy to Jaitley's "genuis" and Modi's "Gross Divisive Politics", Gandhi mocked the Modi-led National Democratic Alliance (NDA) government over a reduced GDP, this quarter. The growth in GDP during 2017-18 is estimated at 6.5 percent, as compared to the growth rate of 7.1 percent in 2016-17, the Ministry of Statistics and Programme Implementation had noted on Friday. As per data released by the Central Statistics Office (CSO), Real GDP at constant (2011-12) prices in the year 2017-18 is likely to attain a level of Rs 129.85 lakh crore, as against the Provisional Estimate of GDP for the year 2016-17 of Rs 121.90 lakh crore, released on 31 May 2017. The sectors, which registered a growth rate of over 7.0 percent, include public administration, defence and other services, trade, hotels, transport, communication and services related to broadcasting, electricity, gas, water supply and other utility services and financial, real estate and professional services. Meanwhile, the budget will be presented on 1 February. This will be the last full-fledged budget for the NDA government.